Alexander Duff served with the 6th Battalion of the Royal Scots, and was attached to the 1st & 5th Battalions. He resided at 8 Wardlaw Place. His name was on the WW1 memorial at North Merchiston Church. 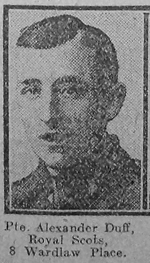 His photo was contained in the Edinburgh Evening News under the title of Scots who have died for their Country. He died on 9th August 1916 and is buried in Cambrin Churchyard Extension, France.